The AutoChill System 20D is designed for use with the Aircast Cryo/Cuff to automatically cycle the water between the cooler and cuff - eliminating the need for manual recycling. During AutoChill operation, the electronic pump automatically cycles compressing the air in the cooler to force chilled water into the cuff. This repetitive cycling maintains continuous cold and applies soothing pulsating pressure. The 20D System includes a wall adapter, air tube assembly, and an air pump attached to a Cryo/Cuff Cooler. By having the pump and cooler secured to each other, the 20D System simplifies application and houses all of the components in one portable package. The Cryo/Cuff Cooler that is included with the 20D System can be used with any Cryo/Cuff model. The AutoChill System 20D includes a Cryo/Cuff Cooler.When the AutoChill system is used with the Ankle Cryo/Cuff, Foot Cryo/Cuff, or Hand and Wrist Cryo/Cuff, it should only be used in a medical facility or clinical environment with direct healthcare provider supervision. Includes: Cooler with Pump attached, Air Tube Assembly, Wall Adapter. 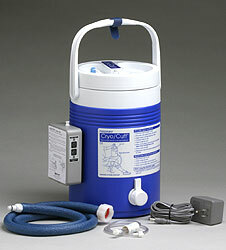 Air Pump attached to Cryo/CuffCooler - the cooler holds enough water and ice for 6 to 8 hours ofcryotherapy. The air pump pressurizes the cooler, automaticallyrecycling the warm water for cold.